Introducing the ASSR Educational License. A remarkable sight for your pupils. The ASSR Educational License installs the complete Alan Parsons’ Art & Science Of Sound Recording video series as a stand-alone app on individual workstations in your lab. The Educational License makes this award-winning body of work available to all your students in a fast, accessible format tailor-made for learning. New in 2019: Music Production Curriculum - an integrated suite of materials to support the Education License. Click here to download our new Educational Brochure. Click here to download the BASS Lesson from our Music Production Curriculum FREE. The ASSR Educational License is delivered on a custom USB card. The app can be installed on as many workstations as you wish, from one to several hundred. The Educational License offers a unique 'school code' and 'admin' (the course director) enabling each institution to utilize this body of work in ways best suited to the course or experience level of the students. In 2019 we are also offering this as part of a fully integrated Music Production Curriculum, where the video content is referenced and cross-referenced in a series of 24 Lesson Plans. The Educational License displays all 24 videos in a custom video browser. After installation, open the app and the browser displays icons for the first five video lessons. Simply scroll left or right to see all 24 videos. Select a video and its contents and main ‘topics’ are displayed in the Lesson Guide below so you can see exactly what is going to be covered. Click on a topic and go directly to that point within the video (EG ‘polar patterns’ within the Microphone Section). You only need to be online when activating the installation. However if the workstation is connected to the internet you will be able to use links that take students directly to the main ASSR website, the Forums, and a new Student Center portal. Instructors can view Quiz results with multiple viewing options: an individual Quiz, an individual student or the performance of the class as a whole. Access to the Student Center is provided entirely free of charge to all students within an academic institution purchasing the ASSR Education License for the first calendar year. An annual admin fee to cover access to the online bonus materials may be purchased for just $299. All 10 hours of award-winning video permanently and instantly available on individual workstations. Available for PC (Window XP, Windows 7) or Mac (10.6 and above) platforms in English, Spanish and German language versions. All 24 videos play locally and instantly in the video browser. Instant navigation to all the different topics contained in each video. Free Student Center access for 1 year for every student to take the online Quizzes. Course Director can monitor Quiz results with multiple views. Special student pricing on physical copies of the DVD set. Now part of a new integrated Music Production Curriculum that includes Lesson Plans. Why get the Educational License? 1. The Educational License's dedicated video browser is a transforming experience. You don't have to load a DVD or navigate through the menu. Just click, select and play any topic within the entire 10 hours of video material in an instant. 2. Students will learn more. Having the DVD set in your library is wonderful but essentially this only gives a single student 'one-time access. The Educational License gives full access to all your students for on-going reference and study over the length of the course. 3. Use with the Music Production Curriculum for a fully integrated learning experience, or build your own assignments and projects. Uninterrupted access enables students to continually refer to and cross-reference topics covered in ASSR Music Production Curriculum or with modules and assignments that you create yourself. 4. 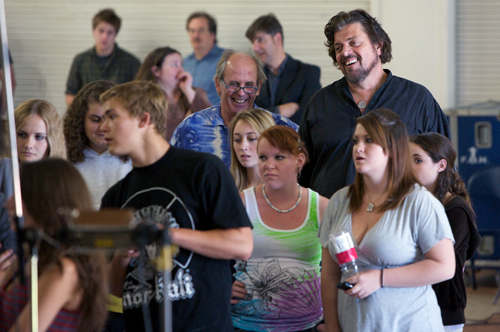 Effectively, Alan Parsons can become your teaching assistant! 5. The Quizzes are icing on an already substantial cake. Quizzes are a great way to reinforce basic knowledge. As your school's admin you can also monitor progress – both each individual student and the class as a whole. Who is the Educational License suitable for? ASSR is suitable for all ages and skills levels at High School (aged 15+) and on through college. With the increased availability of media arts and technology courses at 2-year and 4-year colleges, plus the continued success of independent training centers and career schools, it has become increasingly important for global standards to be established in digital audio recording practices. Do you run a course on video, performance arts, TV and film, game design? A working knowledge of audio and recording technology is at the very least a valuable asset. It could possibly make the difference between a job, an internship, or 'back home' once their course has ended. The Educational License is a particularly effective teaching solution for these related disciplines. Session Files. Session Files are raw multitracks recorded at our Master Class Training Sessions. 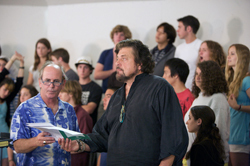 Each session is produced by Alan Parsons and features A-list session players or professional bands. In addition to the 88.2kHz/24-bit wave files, each Session File includes its own track sheet with information about mics and processing, custom photos taken on the day, and guerrilla video. Session Files will be of particular interest to music and recording programs as professional 'source material' for students to study, process, remix and learn from. One of the ten currently available Session Files is All Our Yesterdays, the featured song on the Art & Science Of Sound Recording videos. Full details and pricing is available in the ASSR online Shop. Session Files may be purchased individually but are also a key component in the new Music Production Curriculum. Either apply to our education director at edu@artandscienceofsound.com or, through KEYFAX NewMedia on 1-800-752-2780, for full details of the ASSR Educational License or proceed to the pricing page and our online order form.